Two populations of gopher tortoises (Gopherus polyphemus) were translocated to North Pasture in the northern section of the island. The first arrived between 1987 and 1993, with 25–30 unmarked individuals released. The Georgia Department of Natural Resources translocated 74 marked individuals (23 males, 32 females, and 19 immature) from a site being developed in Bulloch County, Georgia, in 1994. The gopher tortoise—a large terrestrial turtle—reaches a maximum carapace length of about 15 inches. The species prefers deep, sandy soils in areas originally dominated by longleaf pine. The sandy environment allows gopher tortoises to dig burrows that average 15 feet in length and six feet in depth. The burrows moderate temperatures and humidity and provide refuge from the frequent fire of the longleaf pine systems. Their diet consists of grasses and low-growing herbaceous species that reside in open habitats maintained by fire or mowing. The gopher tortoise is a keystone species in these ecosystems, with its burrows providing refuge for 350 to 400 invertebrates and several vertebrate species. Gopher tortoises range from southern South Carolina to Florida and west to the Florida Parishes of Louisiana. On St. Catherines Island, the species exists solely in the managed longleaf pine woodland on the northern end of the island. While not seen on the island in recent times, the species’ remains were discovered on Georgia barrier islands from the Woodland and Mississippian periods (2450 years ago) and during the historic period. The state of Georgia lists the gopher tortoise as “Threatened.” The species is considered declining throughout its range. The U.S. Fish and Wildlife Service classifies the species as “Threatened” in the western part of its range—in Louisiana, Mississippi, and Alabama (west of the Mobile and Tombigbee rivers)—and under consideration for federal status in its eastern range. 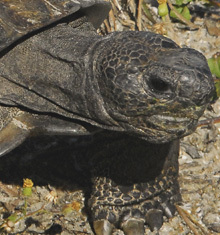 Tracey D. Tuberville, Terry M. Norton, Brian D. Todd, Jeffrey S. Spratt, Long-term apparent survival of translocated gopher tortoises: A comparison of newly released and previously established animals, published in Biological Conservation, 2008. Amphibians and Reptiles of Georgia, edited by J.B. Jensen, C.D. Camp, W. Gibbons and M.J. Elliott, University of Georgia Press, 2008. A fossil and zoo archaeological history of the gopher tortoise (Gopherus polyphemus) in the southeastern United States by Richard Franz and Irvy R. Quitmyer, published in the Bulletin of the Florida Museum of Natural History. (2005) 45(4): 179-199.